9 Now Absalom happened to meet David’s men. He was riding his mule, and as the mule went under the thick branches of a large oak, Absalom’s head got caught in the tree. He was left hanging in mid-air, while the mule he was riding kept on going. A few Hebrew manuscripts, Septuagint, Vulgate & Syriac; most Hebrew manuscripts may be translated, Absalom, whoever you may be. Or, otherwise, if I had acted treacherously towards him. Sunlight coming trough the forest canopy illuminates this scene from above. 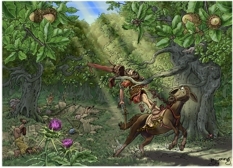 Absalom (David’s son) can be seen with his head caught in an oak tree branch. Two of Absalom’s men dead in a ditch on the left of the scene, being chased by five of David’s men, in the background. This scene was drawn A3 (420 × 297 mm) in size, then coloured & finally reduced to A4 (297 × 210 mm). It was requested by my mum, which I will give here for a Christmas (2014) present on a printed canvas! 2 Kings 16, Verse 24 states “David went to Mahanaim, and Absalom crossed the Jordan with all the men of Israel.” So where is Mahanaim? The name Mahanaim (also maḥăneh) means “Two camps”, “Two hosts”, or “Two armies”. The exact site of the old city is unclear, being a place in modern Jordan, on the eastern side of the Jordan river, north of the Jabbok river. Various commentaries offer several possible sites for the city, but none are conclusive. Mahanaim is where Jacob was met by the “angels of God” (Genesis 32:2) & it was he who named the place. This is where he divided his family & belongings into “two hosts” (possibly giving rise to the name of the city) on his return from Padan-aram (Genesis 32:2). Alternatively “Two hosts” could refer to the angelic camp & Jacob’s human one. These events took place about 1900 BC. After Jacob there was a city built at the site, which was inhabited by the priests of God (Joshua 21:38.) These events took place about 1400 BC. The scene I have illustrated occurred in 976 BC, when David made Mahanaim his headquarters, after he fled from Jerusalem on the rebellion of his son Absalom. David mustered his forces in Mahanaim & sent them out against the Israelite army that had gathered around Absalom. The encounter between the two armies occurred in the countryside near Mahanaim. The action ventured into the forest of Ephraim. The first 2 references above (IBD & SBD) indicate some wood or forest of trees, as people in more temperate climates might understand them. But the ISBE reckons that we should not consider a forest to imply lots of trees – very confusing! I wonder if the ISBE is taking it’s direction from the present condition of Israel – where water is in shorter supply & where there are extensive deserts. The country may have been quite different in the past. There is the phrase I remember being used in geography lessons at school: “the present is the key to the past”, but I think that idea should only be applied with much caution. Israel today may be entirely different to how it was in the past. I wonder just how thickly vegetated, or extensive such “forests” were centuries ago in the Holy lands. It seems to be of little use to examine Israel as it is today, to discover what it might have been like in the past. Extensive & highly destructive over-grazing (especially by goat herds) is known to have incredibly destructive effects on the plant life of a country. Coupled with deforestation for building materials & fuel over millennia & we can see why Israel’s flora (trees, at least) must have suffered such decline. The fact is, no-one really knows what the old “forests” would have looked like. I imagine, before mankind became so numerous, that the Holy Lands did indeed have extensive woodlands, perhaps extending for tens of miles across the landscape. The Bible certainly hints at large wild places. I imagine that when mankind was in his infancy there were small settlements surrounded by far-reaching & very extensive woods, forests & wild places, such that early man huddled close together for mutual support & security. But look at Israel today – dwindling resources & a landscape with “mankind” stamped all over it! Whether there actually were extensive forest or not, I don’t often get the chance to illustrate a forest of trees amongst the Bible Cartoons, so I have decided to do just that! Often my scenes occur in the wilderness of Judea, or in other desolate locations, so it is nice (if very time consuming!) to draw a lot of leaves for a change! The dark overgrown woods, with shadows & dangers lurking is very engaging & evocative. I have sunlight streaming onto the scene of Absalom in his haste getting caught by the neck in an oak trees forked branches, with the ever-present threat of hidden chasms & perilous wild animals close by. The forest killed more than the sword. When I read that I decided to include holes, pits & a ditch in the ground, with grasses & undergrowth over the top. These can be seen in the left of the scene, cut down into the limestone rock of the area. The geological map of the area points to Limestone, marl & chert in the region where Mahanaim may be located. Under the right conditions limestone can be dissolved (by acid in rainwater) to form sinkholes, dolines, and caves in what is called a karst landscape. This could well provide the soil & vegetation covered holes, ditches & pits which would be so deadly to the escaping Israelite soldiers in the narrative. I also decided to included representatives of the “wild beats” Adam Clarke spoke of, in this case wolves. Arabian Wolf (Canis lupus arabs) can be seen snarling behind a Quercus calliprinos (Palestine oak) on the left of the scene. Another is partially hidden in the ditch behind the foreground tree on the left. A third wolf can just be picked out in the centre of the scene, behind one of the background trees. There is a Caucasian squirrel in the foreground tree (Sciurus anomalus) looking worriedly at the young usurper & his mule! 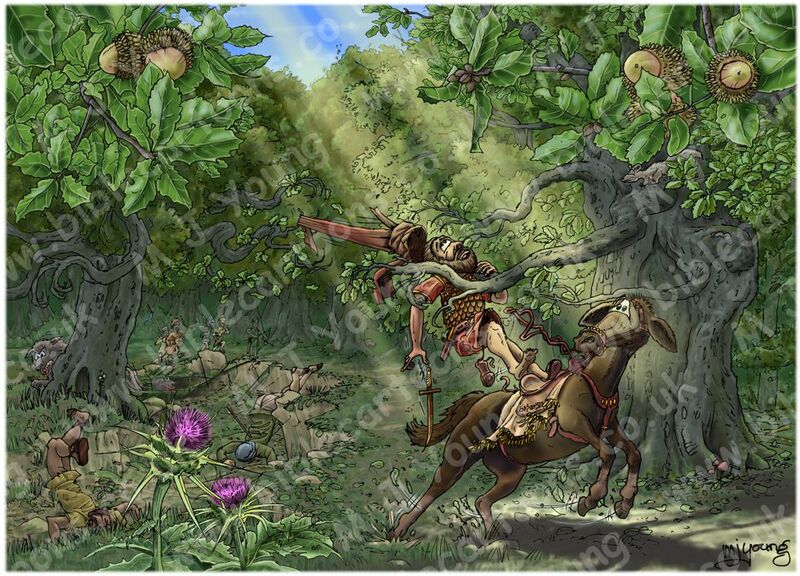 Absalom is described as riding a mule (Equus asinus x Equus caballus (or Equus mulus)) which is the offspring of a male donkey (jack) and a female horse (mare). Horses and donkeys are different species, with different numbers of chromosomes. Of the two F1 hybrids between these two species, a mule is easier to obtain than a hinny, which is the product of a female donkey (jenny) and a male horse (stallion). The trees in this scene are Palestine oak (Quercus calliprinos), which is the most common tree in the typical Israeli Maqui *1. It is an important component of the Mediterranean Maqui in the Galilee, Golan, Carmel, Samaria and Judea mountains. These trees grow mainly on limestone & domomite rock, in nutrient poor Terra Rossa soil *2. Palestine oak is refered to as a small to medium-sized tree or large shrub, reaching 16.5-60.0 feet (5–18 metres) tall. Often they are only 3-10 feet) (1-3 metres) tall due to heavy browsed by goats. Tree trunk diameter is about 3 feet (1 metre). Quercus calliprinos is evergreen, with spiny-serrated leaves 1.1-2.0 inches (3-5 cm) long and 0.6-1.1 inches (1.5-3 cm) broad. Its leaves are small, dark green and stiff. It is a typical example of the Mediterranean arboreal trees and shrubs characterized by small and rigid leaves. Their margins are dentate-thorny. The young leaves are soft, and light and fresh green in color. The leaf persists for 2-3 years, and then abscises (even though the tree is regarded as evergreen, i.e. it never sheds all of its leaves at once). In a mature oak Maqui, the ground is covered by a soft thick carpet of dead leaves, which decay slowly until they turn into fertile forest soil. Quercus calliprinos blooms during March-April & produces acorns which are 1.1-1.6 inches (3-4 cm) long and 0.8-1.1 inches (2-3 cm) diameter when mature, which is about 18 months after pollination. held in a cup covered in dense, elongated, reflexed scales. The immature acorns are gray, similarly to the bark of the branches, and ripen only after 6 months, in the autumn, becoming small brown acorns that sit within deep light green cupules. Less than half of the acorn protrudes out of the cupule. The scales of the cupule are erect. Quercus calliprinos is closely related to the Kermes oak (Q. coccifera) of the western Mediterranean, and is treated as a subspecies or variety of it by some botanists. The Kermes oak is distinguished from it by its smaller size (usually shrubby, not over 10 m) and smaller acorns less than 2 cm diameter. In the left foreground are two purple-red thistles which are Holy Thistle (aka Our Lady’s Thistle, Milk Thistle (Silybum marianum)), from the Family: Asteraceae. I could be confident that this plant grows in the Mahanaim area, since it occurs throughout northern & central Israel, although it prefers heavy soils. 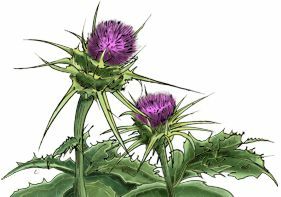 I was going to draw Spear Thistle (Carduus lanceolatus), as a verbal reference to the battle which was taking place in the forest, but couldn’t get confirmation that it grows in the area, or indeed, in Israel at all, so I didn’t use it in the end. Most of the name “Absalom” (which apparently means “my father is peace”) can be seen written in Hebrew text on the leather of the mule’s saddle.